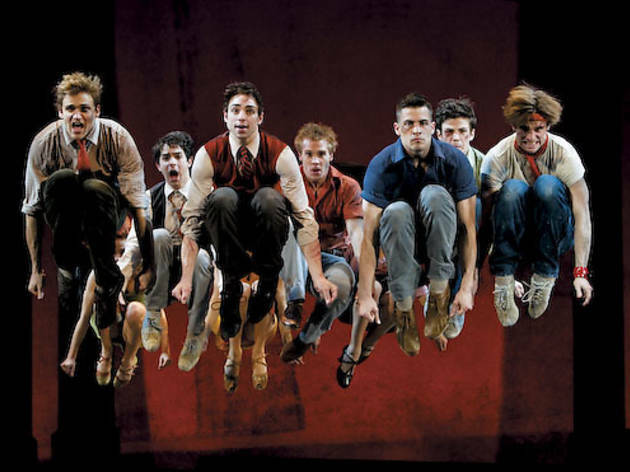 Jerome Robbins’s choreography and Leonard Bernstein’s score make the touring version of the 2009 Broadway revival somewhere worth going tonight. 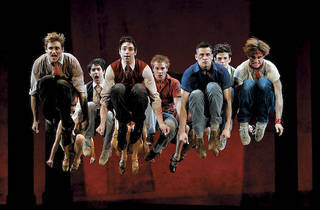 Finding new ways in to the 54-year-old West Side Story turns out to be easy, Action. This touring production based on the 2009 Broadway revival directed by Laurents, who died earlier this year at 93, scruffs up the clean-cut Jets and Sharks, jettisons some of the goofier slang and admirably transposes some of the dialogue and lyrics among the Puerto Rican Sharks into Spanish (rendered by In the Heights scribe Lin-Manuel Miranda). Though the latter move reportedly met with resistance from Broadway audiences, you don’t have to be fluent to follow; Saint, following Laurents’s lead, and dance director Joey McKneely, re-creating Jerome Robbins’s choreography, effectively use body language as subtitles. The minor storytelling problems remain in the show’s transfer of Romeo and Juliet to 1950s New York; the sudden courtship between Tony and Maria is even more headlong than those Verona kids’ (though actors Kyle Harris and the terrific Ali Ewoldt demonstrate convincing chemistry), and the placement of the second-act dream ballet “Somewhere” and its follower, the comic “Gee, Officer Krupke,” still seems awkward. But Laurents’s script tweaks seem to balance the playing field between the Sharks and Jets, with Christopher Patrick Mullen’s thuggish Lt. Schrank bearing down on both sides. Robbins’s jazzy, pugnacious choreography is well represented; the “Dance at the Gym” sequence is a fierce showdown, while the Jets’ finger-snapping “Cool” is a strikingly executed embodiment of tension and frustration. Along with Bernstein’s gorgeous, complex score, Robbins’s work remains the best reason to revisit the West Side.